Brave the treacherous, Kraken-infested seas, for two days of training, discourse and tournaments! All in the advancement of the Arts Martial. Saturday will start from 10am onwards, for training. The Saturday evening will see a tavern feast held at Kraken Hall, starting at 6pm. Sunday morning will see more training at Kraken Hall. 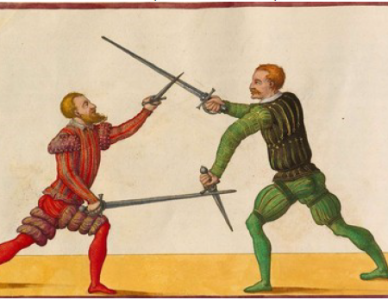 Then at 2pm, the Autumn Heavy and Rapier tournaments will be held, as part of the Baronial tournament circuit, to decide which Ynys Fawr resident will be the Baronial Rapier and /or Heavy champions. Our teacher this year will be Master Emrys Tudur, who will be teaching us in the subtle arts of Spanish sword craft. When: 10am to late, Saturday the 25th of May 2019. 10am to 4pm, Sunday the 26th of May 2019. Before 1 May: adult and under 18: $30 for full event, spectators $5 per day, feast only $20. Under 14 free. Non-members add $5. Un-booked or booked from 1 May: adult and under 18: $35 for full event, spectators $10 per day, feast only $25. Under 14 free. Non-members add $5. Steward: The Honourable Declan of Drogheda (Darren West) phone 0448 979 535. Bookings Officer: To be confirmed (Facebook is not being used for bookings). A supplemented pot luck lunch will be provided on Saturday and Sunday. Non-SCA members will need to pay a $5 event membership per person, including children. No refunds without good reason as approved by the Steward.